in the gardens which from Maiano stretch to these banks. the shores and now no one is guiltless. The poem “La primavera hitleriana”, from the collection “La bufera ed altro”, is one of the most enchanting of Montale’s works. It is rich in historical references, but also cultural and personal ones. The poem was born from the encounter, in Florence in the spring of 1938, between Mussolini and Hitler. 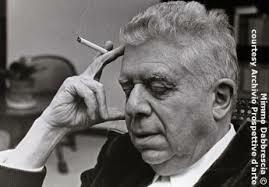 The allegiance between the two men was irreparably strengthened and this, for Montale, is a clear indication of the catastrophe to come. After the encounter, fascism took a more aggressive turn towards anti-Semitism, and racial laws were put into effect in the following September. Being Jewish, Irma Brandeis (the woman Montale loved) would migrate to the USA. In many of the poems found in the collection, Irma Brandeis is conceived as the mediator between the earth and the heavens. She is a sort of “woman-angel” capable of rectifying with her presence the world’s evils and saving it from the barbaric nazi-facism. Sometimes, when translating something so rich in cultural references we are tempted to paraphrase. Is translation meant to ‘explain’ a text? Is an enigmatic translation allowed? I don’t know. I listened to the text and tried to recreate the sounds. There were times when I did “clarify”: For eliotrope, in fact, I used sunflower. Because I think he meant sunflower. Other times, I stayed close to the text. Below are some explanations. *In Italy the war-cry (modified as Eja Eja Alalà) was invented by Gabriele D’Annunzio, using the Greek war cry preceded by a Sardinian shout, in place of what he considered the barbaric ‘Hip! Hip! Hurrah!’ It was used by the aviation corps during WWI, and was then adopted by the Fascist movement. In many translations of the poem it is ‘Heil Hitler’. *lively medieval dance of the common folk, also mentioned in Dante and Boccaccio, where the movements are similar to moths beating their wings against the ground.